EU President Tusk: Brexit without Agreement is increasingly Likely. 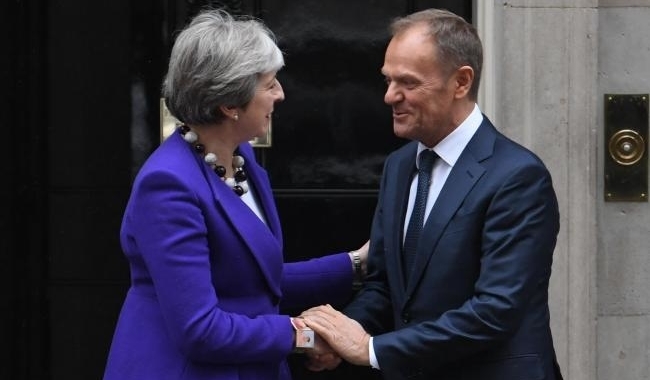 The scenario that the UK is leaving the EU without an agreement on divorce and the future is “more likely than ever,” writes EU President Donald Tusk in his invitation to EU leaders for a two-day summit in Brussels. and we must take responsibility and prepare for a no-deal scenario. “that is more likely than ever”, Tusk said in his letter. Wednesday evening, the leaders of the 27 EU member states meet to discuss how to proceed with the negotiations with the British. Tusk has asked British Prime Minister Theresa May, who may not be present at this discussion, to give her vision. will inform the 27 leaders on Wednesday of the latest developments during the working dinner. The European Commission will also explain. The committee is preparing legal arrangements in case London and Brussels cannot agree. Tusk addresses that all this should not divert the EU from all efforts to reach the best possible deal for all. “That must be our institution, let us not give up”, says the EU president. Tusk calls all 28 government leaders to Brussels in mid-November to finalise the agreement at the highest level.